The liars faced a shocking new threat in the latest episode of Pretty Little Liars that could wind up with them, and their boyfriends, heading to prison to join Alison. If you haven’t seen the latest episode of Pretty Little Liars and don’t want any spoilers we suggest you stop reading now. If you have seen it and want to relive the action then keep reading. Lieutenant Tanner (Roma Maffia) approved another search around Mona’s (Janel Parrish) house as they hunt for clues as to where her body might be. 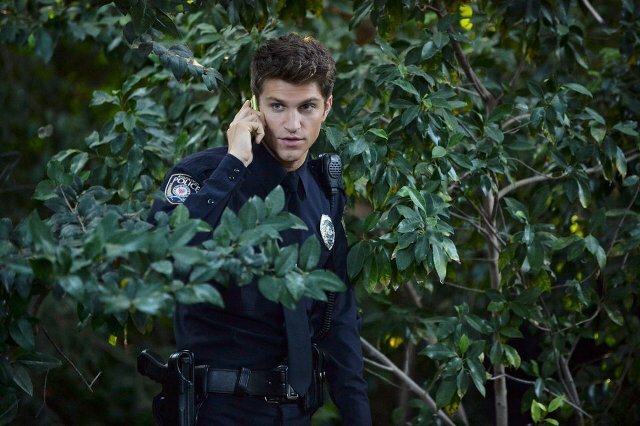 Whilst searching in the woods at the back of the property, Toby (Keegan Allen) discovered a knife that belongs to his family that was covered in blood. Deciding not to declare his find, he covered the knife up and told Spencer (Troian Bellisario) and Caleb (Tyler Blackburn) what he’d found. Torn between doing the right thing (e.g. turning it in to the police as evidence) and destroying the evidence, Toby made the decision to leave the knife where it is causing Spencer and Caleb to panic. Promising not to touch it, it wasn’t long before Spencer and Caleb teamed up to get rid of the knife. Prior to relocating it Caleb talked about his criminal past and explained why being framed for murder isn’t something he’s particularly keen on at this stage in his life. Off to the woods Spencer and Caleb went where they found the knife. Caleb chickened out of throwing the knife into a lake so Spencer suggested they put it in the school kiln to destroy it. Once they’d figured out how to work the kiln, Spencer left Caleb to deal with it after she heard noises in the hall. Unfortunately for Caleb he ended up locked in the kiln as the temperature rapidly rose and Spencer saved him just in the time. Their actions weren’t greeted well by Toby who rowed with Spencer outside the Rear Window Brew. As Spencer tried to explain what she’d done, and pointed out that Toby had also broken his promise to leave the knife where it was, Toby told her that she can’t tell him about her illegal activity any more as it puts him in a difficult situation. Emily (Shay Mitchell) threw herself into her job at the newly renovated Rear Window Brew ahead of its launch party. When new boss Ezra (Ian Harding) had trouble with the launch planner, Emily saw an opportunity to step in and earn some cash so she could go and visit Paige (Lindsey Shaw). Completely out of her depth, Emily’s attempts at catering were pretty terrible and Ezra brought in a professional called Talia (Miranda Rae Mayo). Angry that her turf had been stepped on Emily was nothing short of vile to Talia but when he empanadas went horribly wrong, Emily broke down and explained to Talia why she was so angry. She also told Ezra to hire Talia to take care of the catering for the Brew. Hanna (Ashley Benson) had a couple of surprises in this week’s episode and her first was a visit to a trailer park to find Holbrook (Sean Faris). After blowing off her college campus tour, Hanna set out to talk to the detective who has been M.I.A. in recent weeks but instead she had the pleasure of meeting his father. During a brief chat he mistook Hanna for Alison (Sasha Pieterse) and indicated that there was some relationship between Holbrook and Alison. As she returned to her car, Hanna picked up the fluffy bear she’d been given during her campus tour to find it had been stitched up. As she pull the stitching away, a load of raw meat fell from the bear’s gut. Nice! Big problems ahead for Ezria? Aria (Lucy Hale) spent most of the episode down in the dumps about being rejected from her college choices and put on the waiting list for one of them. After revealing all to Ezra about her college failure, he informed her that his ex Jackie (Paloma Guzman) worked in the admissions department of the college she was on the waiting list for. Taking Emily’s advice far too literally, Aria sent Jackie a detailed letter saying she regretted her relationship with Ezra and squandering her high school years on him. Realising she’d made an epic mistake Aria paid Jackie a visit and convinced her to admit her to the college. The only problem now is that she has a secret with Jackie about Ezra and A got hold of her letter leaving an excerpt on a bookmark in Ezra’s shop. 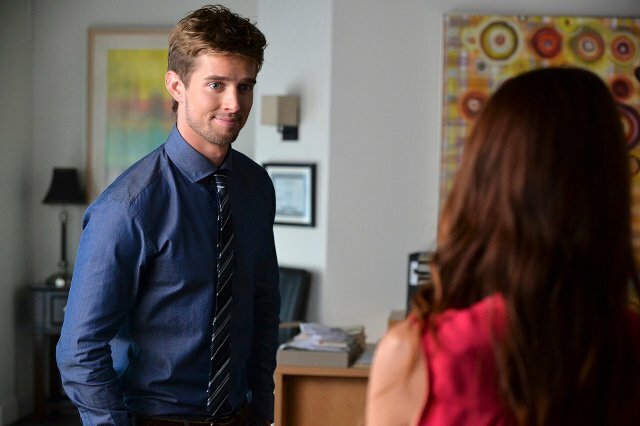 Ashley Marin (Laura Leighton) hit the jackpot this week when her relationship with Jason DiLaurentis (Drew Van Acker) took a very interesting turn. Working together at Jessica’s real estate business, Ashley decided she wanted to leave leading Jason to beg her to stay so that he earns his place in the business. After Ashley covered for Jason when Ali tried to contact him, the two shared a lot of glances that we thought we’d read completely wrong. Later in the episode Jason turned up at Ashley’s house to discuss one of their properties. One thing led to another and soon they were sharing dinner and drinks. As Jason prepared to leave he planted a kiss on Ashley, which was awkward for all of 5 minutes until she reciprocated and things headed to the bedroom. As Jason sneaked out of the house, he was unaware that Hanna had arrived home and she knew that he’d been getting intimate with her mother. Ali found life behind bars unsurprisingly pretty grim. She was moved to a new prison but refused to tell Toby why when he bumped into her. Judging from the bruises on her arms and her comments about ‘fresh meat’ it’s safe to say she became a target for her inmates. During the episode Hanna visited her and told her she knew about the connection with Holbrook. She also told her she’d found the knife. Ali denied everything and explained to Hanna that she was supposed to meet Cyrus the night Mona was killed and that A had set it up so she was easy to frame. Do we believe her? At the end of the episode she received a note, presumably from A, telling her that she would see her friends again very soon. EEK! !